Definition at line 21 of file CLTransformation2D.h. Definition at line 25 of file CLTransformation2D.cpp. 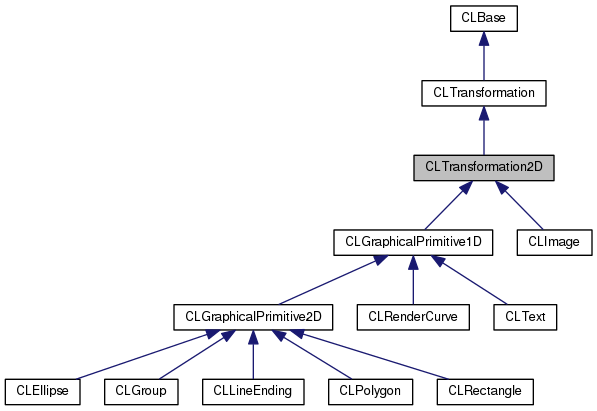 References CLTransformation::IDENTITY3D, CLTransformation::mMatrix, and updateMatrix2D(). Definition at line 40 of file CLTransformation2D.cpp. Definition at line 48 of file CLTransformation2D.cpp. Adds the attributes for a 2d transformation object to the passed in. object. Definition at line 189 of file CLTransformation2D.cpp. Referenced by CLGraphicalPrimitive1D::addSBMLAttributes(), and CLImage::toSBML(). Returns a string to represent the 2D transformation. Definition at line 96 of file CLTransformation2D.cpp. Returns a 2D identity matrix. The matrix contains 6 values. Definition at line 89 of file CLTransformation2D.cpp. Returns the matrix. The matrix contains 6 values. Definition at line 80 of file CLTransformation2D.cpp. Sets the transformation matrix from the given string. The string has to contain either 6 or 12 numerical values seperated by ",". Otherwise the matrix is set to the identity matrix. Definition at line 149 of file CLTransformation2D.cpp. References mMatrix2D, CLTransformation::parseTransformation(), updateMatrix2D(), and updateMatrix3D(). Referenced by CCopasiXMLParser::ImageElement::start(), CCopasiXMLParser::RectangleElement::start(), CCopasiXMLParser::EllipseElement::start(), CCopasiXMLParser::TextElement::start(), CCopasiXMLParser::RenderCurveElement::start(), CCopasiXMLParser::PolygonElement::start(), and CCopasiXMLParser::GroupElement::start(). Sets the 3D matrix. The 2D matrix is updated accordingly. Definition at line 143 of file CLTransformation2D.cpp. Sets the 2D matrix. The 3D matrix is updated accordingly. Definition at line 64 of file CLTransformation2D.cpp. Fills the 2D matrix with data from the 3D matrix. Definition at line 133 of file CLTransformation2D.cpp. Referenced by CLTransformation2D(), parseTransformation(), and setMatrix(). Sets the 3D matrix from the 2D matrix. Definition at line 114 of file CLTransformation2D.cpp. Referenced by parseTransformation(), and setMatrix2D(). Definition at line 24 of file CLTransformation2D.h. Definition at line 92 of file CLTransformation2D.h. Referenced by addSBMLAttributes(), get2DTransformationString(), getMatrix2D(), parseTransformation(), setMatrix2D(), updateMatrix2D(), and updateMatrix3D().